I don’t know about you, but I find that Monday dinners are the hardest to get on the table, fast. Coming home from a full day’s work after a relaxing weekend – it’s hard to get back into the routine and I’m always in a rush to prepare anything decent. What I’ve found to work for us, is that I pre-prepare dishes that we can heat up for Monday night. That way, all we need to do is to cook the rice, add some veges and heat up the main dish. Therefore you’d find that this blog category mainly consists of curry and other slow-cook meals. Not your typical Monday dinners of quick throw together meals, but instead meals that have been cooked with tender loving care that can be reheated in a matter of minutes. Click over under the Monday Dinner tab to see what other slow-cook meals I have in my repertoire. This curry is sweet with a bit of kick. combine 1 tbsp of each (except where indicated otherwise) in a mortar and bash them together. ** save the remainder of your spices mix for the next curry. 1. 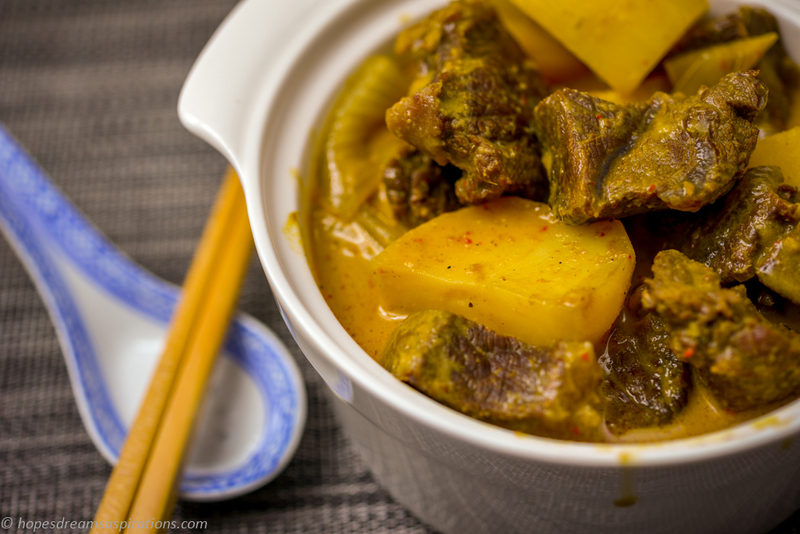 Coat beef in 1 tablespoon of peanut oil and massaman curry paste. Stir well to coat and set aside. 2. In a large pot, heat remaining oil over a medium heat. 3. Add the curry-coated beef and brown for 1-2 minutes. Add the dry spices. Stir the beef well to coat it in the spices. 5. After this time, add the remaining can of coconut cream, potatoes and peanuts. Stir well. Taste and add a little more fish sauce and sugar if necessary. 6. Turn heat up to medium and cover. Cook for another 30 minutes or until potatoes are tender. 7. Meanwhile, prepare the tamarind juice. Soak the dried tamarind seed in 2 tablespoons of warm water and use a spoon to push the pulp off the seeds into the water. The water will become brown and pulpy — this is tamarind juice. Discard the seeds. 8. 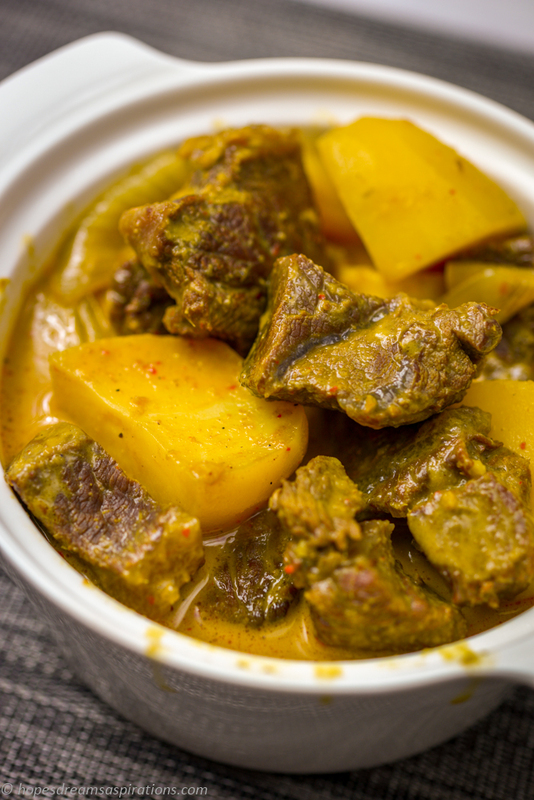 Once the potatoes are cooked, remove the curry from the heat. Stir in the sugar and tamarind juice. Stir well and serve with Jasmine rice.